Internal links are links you add to the content of your website to link one of your pages to another. They are a great way to keep visitors on your website as well as to help them find what they are looking for. Internal links are important to SEO as well. Why Internal Links are Important to SEO? Internal links help Google understand how content relates to other content. They also help Google find content on your website. Link value, or link equity, is another important factor to consider. Google attributes a value to backlinks you have on a website page. The page that gets the backlink isn’t the only one that gets that value, though. This is because Google passes on link value to all the other links on that page, i.e. the internal links. So, adding internal links to your website’s pages maximises the benefits of each backlink you get. Links in your main menu, secondary menu, and other navigational elements are important to a good internal linking strategy. As a result, ensuring your menus are optimised is important. You need to go further than this, however, by adding links to the content of your pages. There are lots of ways you can do this, including adding related posts and popular posts sections. Linking within text on the page is essential too. Let’s look at how to do that effectively as it requires a bit of planning to get right. The first step is to identify the best content on your website. This is usually content that is core to your business, products, or services. It is your cornerstone content. So, taking the above point, should you create lots of blog posts and add a link on each of them to your cornerstone pages? Yes, but that’s only part of it. You also need to internally link between non-cornerstone content. These links will provide context to Google and your visitors by connecting content on similar topics together. Here is an example of how the above might work. Blog posts 1, 3, and 6 are all on similar topics in this example. Therefore, they should all link to each other. Blog posts 2, 4, and 5 are all on similar topics, so they should all link to each other. One final thought in relation to this topic concerns anchor text. Anchor text is the text that contains the link on your website’s page. It’s important as it’s potentially damaging to over-optimise anchor text. Back to the example to explain this, let’s say the topic for the cornerstone content is “Home Renovations Contractor”. You will over-optimise the anchor text when linking to this page if you always use the phrase “home renovations contractor”. The better approach is to vary the anchor text as much as possible. If you don’t already add internal links to your content, you will need to spend time or resources adding them. Once you get in the swing of it, though, adding internal links to your content will start to happen naturally. If you run a business in the building trade, your potential customers will use the internet when looking for the services you offer. This applies whether you are a building contractor, plumbing company, electrician, painting contractor, landscape designer, or any other company involved in the building trade. This means you need a website, but to really stand out from the competition and catch the eye of potential customers, you need a website with the following nine elements. They are all important to include on building trade-related websites, so keep them in mind whenever you’re looking for website design in Auckland. Customers looking for your services do not expect a cutting-edge website and futuristic design. Instead, all they want to know is whether or not you’re capable of completing the work, the experience you have in the industry, and why they should choose you. They also want to know if they can trust you. The following points will help you give this information to potential customers, but it all starts with having a modern website with a clean and crisp appearance. Leave the bells-and-whistles to the media companies and tech start-ups. So, if you’re a painting company, for example, you could have separate pages for interior and exterior painting. Even though you have services pages, make sure you include all your main services somewhere on your homepage. This will ensure you don’t lose anyone who quickly scans your homepage to check if you offer what they need. As a company in the building trade, you need customers to contact you. Only then can you arrange to quote for the project. Therefore, make it as easy as possible for them to do so. This means putting your contact details, ideally your phone number, on every page of your website. You also need to explicitly tell people what you want them to do. As you want them to call you, ask them to do so with calls to action… on every page. Most websites for companies in the building trade have a combination of both. In terms of the bespoke images you create, make sure they are as professional and attractive as possible. This means considering things like background, lighting, the appearance of people in the photos, and more. Customer testimonials alone won’t help you win new contracts from your website, but they do help build trust. Again, a gallery page is unlikely to seal the deal on a new contract or project, but it does help potential customers get a better understanding of your capabilities. It also demonstrates that you are proud of the work you complete for customers. Finally, add badges and logos of professional organisations and any relevant affiliations you have. Often, these appear in the footer of your website so they are always visible, although you may choose to include them on the homepage only. Here’s one bonus tip to finish off – when looking for website design in Auckland and deciding on a company to build your new website, choose one with experience of creating websites for companies like yours. Whether you sell products online or not, you can find new customers for your business using online marketing. There are lots of marketing channels you can use to reach and convert those customers. Central to your success in achieving this objective, however, is your website, so it needs to be as good as possible. What is great website design in Auckland, though? There are lots of technical, structural, and design elements that make up a website. The most important thing to remember, however, is that every decision taken when designing your website must be focused on making your online marketing efforts a success. This applies to the colours you choose, the content you include, the design of the navigation, etc. Everything must have the right focus. This might sound like a straightforward approach, but when looking for website design Auckland, you’ll encounter a lot of designers whose objectives won’t be in line with yours. So, here’s the first tip – make sure you get a website designer who understands how to develop websites that generate leads and/or sales. Here are some pointers to help you determine if a website designer has your online success in mind. Is the website super easy to use? For example, there shouldn’t be any requirement for pointers or tips as everything should be self-explanatory. Does the structure of the content and the design of the navigation make it quick and easy for users to find what they are looking for? Ideally, they should be able to find what they need in one or two clicks. Does the website work on mobile devices and is it as easy to use on mobile as it is on desktop? For example, are the buttons as easy to tap on with a finger as they are to click on with a mouse? Are key sections of your website smooth and fully functional? Contact forms and checkout processes are two of the most important as these are the sections that will help you generate sales. As well as having good navigation and an easy to use website, your website should also be appealing to your audience. It should be modern too, so it looks fresh and up-to-date. The content on your website – the text, images, and video – should be focused on your customers. Specifically, it should answer questions that a user will have when they visit your website. The content on your website should answer these questions as well as others that visitors to your website might have. In summary, when looking for a company that offers website development services to develop your new online presence, make sure their focus isn’t on delivering a technically brilliant or heavily design-oriented website. Instead, their focus should be on things like the above to help make your business an online success. Having an attractive and modern website design is not enough to increase your online conversion rates. You also need website design that adopts tried and tested principles. Below are some of the things a website designer will consider when their focus is on increasing your conversions. Your business must first have a value proposition that will be appealing to customers. If it doesn’t, conversion-focused website design will make no difference. For businesses that have a good value proposition, the website must present this succinctly and in a way that appeals to visitors. Pages should be free from distractions and you should present as few choices as possible to visitors. This is because the more choice that people have, the less likely they are to make a decision. Crucially, white space on a website is okay. Simply filling up sections with content for the sake of removing white space is likely to reduce conversions. Your website should be intuitive to the point a visitor should be able to use it without having to think about how or what they should do. This applies to mobile users as much as desktop users. In addition, your website should conform to common internet design principles. Examples include putting your logo either in the top left corner or top middle part of the website. Login/logout buttons are most commonly found in the top right, and menus are most commonly found horizontally close to the top of the page. These are just some examples of design principles that will make your website easy to use. It’s also important your website appeals to your audience. After all, what works for one type of audience may not work for another. This applies to various design elements and aspects including colours, images used, tone of voice, fonts, and more. Visitors to your website should be able to find what they are looking for easily. This primarily means having clear and easy to follow navigation and menus. A good search function can also help, particularly if you sell multiple products on your website. The most important content of a page should be close to the top of the page. The most important section of this part of the page is the first two-thirds reading left to right. The above information can be expanded further down the page. In fact, it’s probably a good idea from an SEO perspective to have plenty of content on the page. The most important things need to be at the top, though. When a visitor is converting (making a purchase, filling in a form, etc), they should be able to do this with as few clicks as possible. The more clicks you have, and the more complicated the process, the more likely they are to leave before completing it. With all the above, the focus should always be on the visitor to your website. If you want to increase conversions, they are all that matters. Adding a blog to your website may seem like a daunting task. Even when you get through the technical part of creating a blog section, how are you going to write content to keep it regularly updated? Add this to the fact that many people find it hard to identify a tangible return on investment from adding a blog to their website. As a result, they don’t. Even when people do, they don’t know where to look to see how the blog is benefiting their business. The blog section then becomes neglected. The reality, however, is that adding a blog to your website and keeping it regularly updated will get you sales. Therefore, you will get a return on investment from having a blog on your website. Blogs give Google more content to evaluate when looking at your website. The result is that Google will add your website (via the blog page) to the search results pages of more keywords. In addition, many of those keywords will be longtail keywords where people are looking for very specific information. These keywords usually have little competition, so it is easy to rank in a high position. Wait – older content typically ranks higher in Google than brand new content. So, wait it out a bit. Keep it up-to-date – you must keep the content up-to-date, however. This ensures Google knows the blog is not only well-aged but is also fresh. For example, let’s say you write a blog with the title Top 10 tips for Buying a Diamond Engagement Ring. The longer it stays published the better, so long as you go back to it regularly to update it with new information and to remove anything that has become obsolete. Promote the blog – the next thing you need is links. There are lots of strategies you can use to achieve this, some of which can be quite expensive and/or time-consuming. There are some simple things you can do, however. This includes sharing the blogs you publish on social media as well as in your email marketing campaigns (if you don’t use social media or email marketing, you should consider starting). This, in turn, will lead to customers thinking of you when they are making a buying decision. After all, they will already have had an interaction with your brand. They could do this immediately after doing the Google search and reading your blog, or it can happen hours, days, weeks, or months later. It’s a simple equation – more of the right type of person visiting your website will increase your sales. So, speak to Kiwi Website Design today about getting a blog added to your website or full SEO Services. Bounce rate is a metric you should be familiar with as it is important to SEO. It is also important to the success of your website as a high bounce rate is often an indicator there is something not right. This isn’t always the case as there are some situations where a high bounce rate is understandable. Most of the time, however, you should take steps to reduce bounce rate as much as possible. Understanding bounce rate is essential before you attempt to implement solutions to reduce it. Bounce rate is the percentage of people who visit your website but then leave after looking at just one page. On most of the pages on your website, this is not a good thing. After all, someone who visits your website and leaves after looking at one page is unlikely to have been interested in what you offer. Google takes a view that is similar to this too. Specifically, a visitor “bouncing” off a page is an indicator to Google that the person didn’t find what they were looking for. The faster the user bounces, the greater the likelihood this is the case. Users don’t wait around for slow loading pages. In fact, if the page takes longer than a couple of seconds to load, you risk losing the visitor because it is not fast enough. If this is the case with your website, you should take steps to make it faster. Don’t forget the mobile versions of your pages too, as they should also load fast. One of the reasons that people bounce from your pages might be because you don’t give them enough options to stay. Internal linking where you add links to your content on other pages is one solution to this. It is an essential solution, in fact, if your content includes elements that require more detailed explanation. If you don’t provide an internal link to that explanation, the user will leave your website to find it. Having content on the page the interests and engages visitors is important too. If the page is mostly text, you also need to make sure it is readable as large blogs of text and long sentences will put off visitors. This applies even when the content itself is fantastic – if it looks daunting to read, visitors will never know how good it is as they will “bounce” to find an alternative that looks less like a chore. Following on from the last point, a great way to make your content more engaging is to add media. This includes videos, animations, images, infographics, and more. This gives visitors an alternative to reading text, plus it is often easier to explain a concept, service, or product in a short video than in words. As mentioned above, people will bounce from your page if they don’t think it answers their query. This can happen if your content is not good enough, but it can also happen by accident, i.e. your pages appearing on search results for keywords not related to your industry, products, or services. The solution is to refine your keyword strategy to ensure you target the right ones. By going through each of the steps above, you will see your bounce rate start to fall. You have several options available to you when getting a new website. One of those options is to get a WordPress-based website. In fact, in most situations, this is the best option. Here are eight reasons why. WordPress is the most widely used website platform in the world. In fact, more than 50 percent of all websites in the world are a WP website. One of the reasons businesses, website owners, and developers use WordPress is because it is robust. It has a well-tested infrastructure and all the tools required to create any type of website. Plus, it’s free. 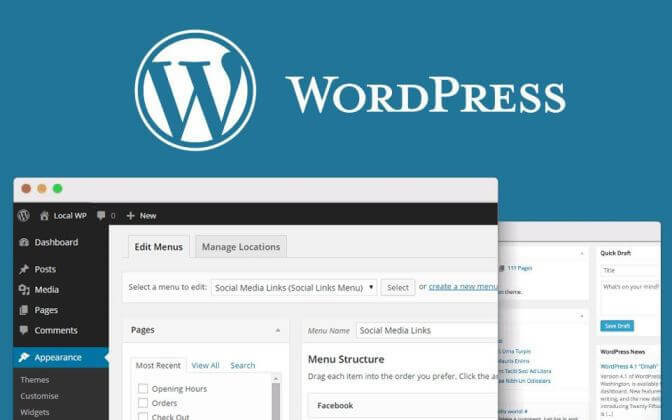 The above point is made possible because WordPress has a strong developer community who help to secure it, identify bugs, and generally support the platform. In addition, this strong community means it is easy to find help whenever it is required. WordPress patches and updates are released on a regular basis. These can be to get rid of bugs, to enhance the functionality, or to make the platform more secure. This protects your website and keeps it working in the ever-changing world of the internet, website browser updates, new phone models, and more. You can find a plugin for just about any tool or feature you want to add to WordPress. Many of these are free, but even premium plugins are usually inexpensive. In other words, you can add functionality to your WordPress-based website without the need to write the code from scratch. As the platform provides the basic infrastructure of your website, and plugins are available for all common functions, development time is kept to a minimum on WordPress-based websites. One other option you have available is to get the website built from scratch, but this takes much longer. WordPress gives your developer a head start. This means they can focus on WordPress home page design with a customised WordPress theme to ensure your website looks great. Another of the big advantages of WordPress is the fact it is super simple to add and change content. The user interface and text editor mean you can add attractive and highly professional pages and blog posts without needing to learn a single line of code. The look and feel of a WordPress-based website comes from its theme. All the features (via plugins and other code), as well as the content of your website, are separate from the theme. This makes it much easier to change the design of your website. Finally, WordPress is a much better option than other common website builders on the market. Examples include Wix and Weebly. They do make it easy to get a website online, but the options you have for customisation and features are very limited. So, whatever business you are in, whatever type of website you want to build, and whatever your budget, WordPress is the best option. If you have heard the term backlinks before, it is probably in relation to SEO. In fact, most SEO professionals believe that backlinks are one of the most important factors to consider when trying to improve the ranking of your website on Google. What are backlinks, though, and how do you get them? The term backlink is used to refer to a situation where a third-party website links to another website. We just did it in the previous sentence. The phrase “term backlink” is linked to the backlink entry on Wikipedia. Therefore, we just gave Wikipedia a backlink. Another term you might hear in relation to backlinks is anchor text. This is the word or phrase that makes up the link. In the above example, the anchor text was the phrase “term backlink”. How Does Google Use Backlinks? The Google search platform is based on a computer algorithm. Of course, that algorithm is big, very advanced, incredibly complex, and, as far as computer programmes go, intelligent. It is still just a computer programme, though. So, how can the Google algorithm determine the ranking of two web pages on the same topic? In real life, there are usually hundreds or thousands of web pages on any particular topic that Google has to rank, but for the purposes of this explanation, we’ll limit the example to two. Google uses what’s called ranking factors to determine which of the two pages is better than the other. As it is a computer algorithm, these ranking factors are objective, i.e. page A has ranking factor 1 which is good, but lacks ranking factor 2, which is bad. Okay, that is a bit over-simplistic, but you get the idea. The fact that ranking factors are objective is important, however. After all, if a person was making the same decision, they would use subjective and objective reasoning. One way that Google gets around this shortcoming (that it can’t use subjective reasoning) is to tap into the subjective reasoning of humans. It does this using backlinks. So, backlinks are a ranking factor that helps Google decide which of the two pages in this example is better than the other. For example, page A might have more backlinks than page B. From Google’s point of view, this means more people have used their objective and subjective reasoning in favour of page A than B, therefore it should rank higher. Other factors come into consideration too, of course – around 200 of them. Backlinks are one of the most important. Website authority – a backlink from a website that has high authority on the internet will be worth more than a backlink from lower authority websites. Therefore, getting links from trusted websites that get high levels of traffic and that regularly appear on Google search results pages will help to improve your ranking in Google. Links from the same source – getting a backlink from a website is good, but the more links you get from the same website, the less powerful or helpful they become. Google’s thinking behind this is that lots of backlinks from the same source don’t hold as much weight as backlinks from multiple sources. Also, lots of backlinks from the same source could be an indication that a website is trying to game the system. Related content – it is also better to get a backlink from content that has some relevance to the content of your own website. For example, let’s say you own a jewellery store and your wife owns a construction company. Getting your wife to put a backlink on her construction company website to your jewellery store website is unlikely to very helpful to your SEO efforts. It is much better, in this situation, to get backlinks from jewellery blogs and other websites in the jewellery industry. Do Follow / No Follow – when a third-party website gives you a backlink, it can either be a Do Follow backlink (which has a dofollow tag) or a No Follow backlink (which has a nofollow tag). The dofollow and nofollow tags tell Google whether or not the website wants Google to follow the link to see the content on your web page. Therefore, Do Follow links are the much better option. The above section highlights some of the dangers when trying to increase the number of backlinks to your website to improve your ranking in Google. After all, on the surface, there is a simple solution – Google likes backlinks so get as many of them as possible from wherever you can. Lots of people have come before you with that thought, though, with many of them using dishonest practices to obtain backlinks. Over the years, Google has responded to this by implementing updates to its algorithm which help it separate good and honest backlinks from those that are trying to trick the algorithm. The anchor text warning – it is good when third-party websites use keywords when they give you a backlink. If this happens too often, however, it can look like over-optimisation which can get you hit with a penalty. Therefore, there must be variety in the anchor text of your backlinks. The getting lots of links, including paying for them, warning – this usually doesn’t work and even when it does, the positive effects don’t last. The much more effective strategy is to get good backlinks from high-quality websites on a consistent basis. The source of backlinks warning – there are steps you can take to encourage websites to give you backlinks, but they should come in naturally. The example above of a jewellery website getting a backlink from a construction company is a good example of a forced or unnatural backlink strategy. If you can’t do these things, what can you do to get backlinks to your website? There are lots of strategies and methods you can use that are all above board. However, they all centre around one essential and indispensable point… a point which is our number one tip for getting backlinks. Create content that is valuable to your readers and that they love reading. People will give you backlinks without you even asking them if you create fantastic content on your website. This could be infographics, blogs, articles, reports, white papers, discussion documents, help guides, or anything else that will be helpful, informative, or entertaining for your audience. The more of this type of content you create, the more good-quality and useful backlinks you will get. A crucial part of all good website design is Search Engine Optimisation (SEO). More specifically, a good website designer will put the right SEO foundation in place, so you can improve or maintain your website’s position on Google search results pages. Two important components of SEO in website design which are often overlooked, however, are page titles and meta descriptions. When a website designer doesn’t place enough emphasis on them, you end up with auto-generated versions that will not deliver for your business. This is despite the fact that page titles and meta descriptions play a huge role in the success of your website in Google search, not least because page titles are one of the search giant’s key ranking factors. When getting a new website designed, here’s what you need to know about page titles and meta descriptions. In technical terms, page titles are an HTML element – or tag – which lets Google and other search engines know the title of a webpage. If you’re writing a blog entry, it is the title of the blog. If you are writing copy for your sales page, it is the title of your sales page. It is important to remember, however, that when we discuss page titles, we are not talking about headings. Headings use header tags (H1, H2, etc) and they are completely different things. Page titles go in the middle of <title></title> HTML tags. While that is technical, it is important as Google uses page titles to help it understand the content of the page. If you don’t use the correct HTML tag, it can’t do this. You can see page titles on every search results page – they are the clickable headline for each search result. Therefore, page titles are important for SEO and user experience. As a result, page titles should be a concise and accurate reflection of the content on the page. Meta descriptions, on the other hand, are short descriptions which summarise the content of your page for the benefit of search engines and the end-user. While meta descriptions are nowhere near as important as they used to be for SEO purposes, they still help. Specifically, they help encourage Google search users to click on your website rather than one of your competitors. This is because the main function of a meta description is to display a short piece of information underneath the title in search engine results. As page titles are so important both in terms of SEO and your click-through rate, knowing how to write them properly is crucial. In fact, taking the time to write an effective page title is a simple, high-impact task which can give your SEO a major boost. Google simply cuts page titles that are too long, so users won’t see the full wording on a search results page. On the flip side, nobody is going to click on something which is half-complete. The general rule is to keep page titles between 40 and 70 characters. For a more technical explanation, the exact limit for a page title is based on a 600-pixel box. This is the width Google allocates to the page title. So, if your page title has lots of wide letters such as “W” or “O”, you are going to have less pixel space to play with. If, however, your page title features letters like “I” or lowercase letters such as “t” and “p”, you will fit more in. If you stuff your page title full of keywords, Google will penalise you and you will not rank very well. After all, page titles that are a list of keywords or keyword variations do nothing to improve user experience. Quite the opposite, in fact, which is why Google takes it so seriously. Don’t try to outsmart Google, either, as its algorithm is now very good at spotting spammy page titles. That said, your page title should include the main keyword of the page. In fact, this is critically important to SEO. Ideally, place the keyword at the start of the page title. While on the topic, it is also helpful to include the page’s keyword in your meta description. Avoid anything else in your page title which could be considered as spam. A good example is the unnecessary use of capital letters – avoid this and instead use normal sentence or title capitalisation. Another example is the use of special characters such as $ or ! or *. You should avoid using these too. If you don’t focus on your target market through your title, what’s the point? After all, these are the people you are trying to make click on it. So, write your titles in a way in a way that will attract clicks from people who are likely to have an interest in your product, service, or what you have to say. Remember, your page titles are a potential visitor’s very first interaction with you when they find your website through a search engine result. This highlights the importance of writing page titles that present your brand in the best light possible. Clickbait is a term that often refers to page titles. Specifically, page titles that sensationalise or misrepresent the actual content on the page in order to get people to visit. For some, it is a tempting approach, particularly if you are in a competitive market. However, the best advice when doing anything in relation to SEO is to never lose focus on users. It is not hard to see that clickbait page titles do not add anything of value to users. In most cases, in fact, they cause frustration and annoyance. Your page title can be confident, but you should never drift into sensationalism and you should always ensure the content behind the title delivers on expectations. Page titles and meta descriptions, particularly the former, are too often ignored by website designers. One of the reasons for this is that modern website design platforms will automatically fill in the gap to ensure your web page works. However, this approach results in page titles that are not optimised so won’t help your SEO. By manually writing and optimising, you will get a competitive edge. Search engine friendly website design means designing your website according to Google’s guidelines. This helps Google understand what your website is about, it ensures Google can find all the pages, and it helps improve your ranking on search results pages. A good website developer and/or SEO agency in Auckland will look after all the elements below on your behalf. However, it is good to have an overview of the topic, so you can ensure you get a fully optimised search engine friendly website. Here’s how you make your website search engine friendly. Website developers can add content to your pages in lots of different ways. This includes using HTML, the standard tagging system for most websites on the internet. It can also include other code such as Java or Flash as well as other types of content including images, video, and audio. Search engines understand and use HTML more than any other type of content, however. Therefore, the most important content on your pages should be in HTML. This means, for example, transcribing audio and video content into text. You should also use image alt tags for the images you include on your website. Image alt tags let you describe the image, so Google understands what it is. Keywords are crucial to SEO, so they are crucial to building a search engine friendly website too. Therefore, you should ensure you include the main keywords you want to target on the main pages of your website. You should also include variations of the keyword too. For example, if your keyword is “how to train your dog”, a variation of that could be “learning to train your dog”. Don’t keyword stuff – this means adding keywords to the page multiple times in the hope it convinces Google your page really, really, really, really, is the best. This simply doesn’t work and can actually lower your ranking in search. Keywords should appear naturally and strategically on your website pages. Don’t cannibalise keywords – this means using a single keyword as the target keyword on multiple pages of your website. For example, having three pages on your website targeting the keyword “how to train your dog”. Doing this simply spreads the value of your content across three pages, rather than directing that value to one page. Ensure your page titles are 70 characters or less. If you make them longer, Google will snip them on its search results pages. Write readable and meaningful page titles that are useful to users. Remember, one of the objectives of page titles is to encourage users to click. Make sure you include the main target keyword in the page title, ideally at the start. Include your company/website name at the end of the page title. Many websites use page titles to create the URL for the page. Therefore, following the SEO guidelines for page titles will ensure you optimise URLs too. There is one additional point to consider, however. Research shows short URLs are more likely to rank higher than long URLs. For your most important keywords, therefore, you should look at shortening the URL. Make sure the content is well-written with no spelling or grammatical mistakes. Write and present the content so it is easy to read. This means using short sentences, short paragraphs, bullet-point lists, sub-headings, and everyday language. Include keywords in the content following the tips above. Ensure the content is unique. Make the content useful and engaging for readers. Google follows all the links on your website to discover all its pages. This includes your menus, for example. There are often occasions when there are pages you want Google to index, but which Google doesn’t know about because it can’t find a link. Pages that only display after a user completes a form. Google doesn’t complete forms when crawling your website, so will not find these pages. Links blocked by your robots.txt file or Meta Robots tag. These two tools perform the same function – they let you tell Google’s crawler which pages on your website you want them to ignore. It is easy to make a mistake when doing this, however, accidentally restricting Google’s access to pages you want it to find. Pages only accessible using a search tool. As with forms, Google’s crawler does not use search boxes on your website. Pages that are linked by a link-stuffed page. Google’s crawler only follows a limited number of links on a page. Therefore, if the only link to a page on your website is from another page that is stuffed with links, Google might not find it. Google does not like duplicate content, i.e. content that appears in multiple locations on the internet. This can be on different websites, but it also doesn’t like duplicate content on a single website either. The problem is there are many legitimate reasons for having duplicate content on your website. For example, having a print-friendly version of a page. There is a solution to this, though – the canonical tag, which you should add to all duplicate pages. The purpose of this tag is to tell Google there is a master copy of the page. <link rel=”canonical” href=”URL”/> where URL is the website address of the master page. So, even if Google doesn’t use meta descriptions as a ranking factor, they are important as they encourage users to click the link to your website. Make sure they are no longer than 120 characters. Google clips meta descriptions that are longer than this. Creating a website that is search engine friendly is the starting point for any effective SEO strategy. Once you have the above in place, you can move onto more advanced SEO techniques, but it is important to have the right foundation in place first. Author adminPosted on July 5, 2018 July 10, 2018 Categories Blog, Seo, Web DesignTags seo, Tips, Website Design, Website Development, Website Project, WordpressLeave a comment on What Is Search Engine Friendly Website Design? There is a huge amount of content on the internet – Google’s index contains billions of pages. Not all content is equal, however, as some can be current or dated, up-to-date or out-of-date, high-quality or low-quality, engaging or uninteresting. From an SEO perspective, there is clear evidence that high-quality content is important to your website’s rankings. Why is this? Google has a tough job when you think about it. On every topic, niche, and keyword, hundreds if not thousands of web pages exist on the internet. How does Google determine which of those pages to display on page one of a search results page? Relevance is important. After all, pages that are closely linked to the topic, niche, or keyword are the ones most likely to give Google’s users the information they need. Even filtering by relevance, however, still leaves a large number of pages to rank. This is where quality becomes important. It is logical, after all. Imagine Google has two website pages on exactly the same topic. How should it order those two pages? Placing the higher quality page first is the logical answer. Of course, there are many factors that Google looks at when ranking website pages. The quality of the content on the page is an over-arching term that covers several of those factors. For example, we all know backlinks are important to SEO in Auckland. When content is high-quality, it is more likely to get backlinks. Keywords are important to SEO too, as is including variations of the main keyword on a page. This is much more likely to happen on a high-quality website page than one that is low-quality. Google itself gives us good indications of the importance it places on quality. It stresses repeatedly, for example, that you should create content for users and not search engines. It also says your website should be “unique, valuable, or engaging”. There is research to back this up too. Backlinko is one of the web’s leading authorities on SEO. It conducted research that included one million search results pages. In relation to content, it found that in-depth and long-form content generally gets higher rankings. Your aim should be to make the content on your website pages better than your competition’s. You can even take this a stage further by striving to make the content you create the best there is on the internet. Let’s go a bit deeper into each of these seven tips. You probably already know duplicate content (copying content from another page or website) is a big no-no in SEO, even if you own the content. In other words, all the content on your website must be unique. Publishing original content goes further than this, however. After all, a good writer can rewrite an article from the internet to make it unique. It is not original, however, as it will still contain the same points and ideas as the source article. It may even have the same structure. Publishing original content involves developing and presenting your own ideas. This applies to all types of content including written content as well as images, infographics, videos, and more. A good SEO agency in Auckland will help you achieve this. According to Google, you should avoid publishing content that has spelling or grammatical errors and that is “awkward or poorly written”. Google is getting much better at identifying content that is poorly written too. There used to be a time several years ago when you would click on a search result in Google to a page that contained text on the topic you were interested in, but where all the words and sentences were jumbled so made no sense. This doesn’t happen anymore as Google can now distinguish between well-written and poorly-written text. We’ve already talked above about making your website better than your competitors’ websites. Achieving this usually involves ensuring the content on your website is genuinely useful to visitors. Google recognises this is several ways. For example, visitors are more likely to bounce from a web page they don’t find useful. Bouncing means visiting a website and leaving in a short period of time (sometimes within just a few seconds) without visiting any other pages on the site. In addition to the SEO benefits of useful content, making the content on your website useful will increase levels of engagement and will help improve your website’s conversion rate. Adding outbound links improves the quality of the content on your website, particularly if the outbound links are to authoritative sources. There are several reasons for this, including the fact that outbound links help Google understand what your page is about. Outbound links are also helpful to users as they give enhanced context and detail on the topic. Research indicates that authoritative outbound links help with SEO too. The Backlinko research mentioned above found that in-depth content on a topic often performs better in Google than lighter content. So, you should go into as much detail as possible when publishing content on your website. Of course, you must ensure the content remains relevant and doesn’t drift or go off on tangents. The more information you give on the topic, however, the more likely it is to rank well on Google. It is possible to have content that follows all the tips above but that is boring and unengaging. Google will identify this by the reaction of users to your content. Bounce rate is something talked about above. Other indicators are shares on social media, how long the user stays on the page, whether they complete a form or make a purchase, etc. Of course, this is another tip that not only helps with SEO, but also with improving your website overall, especially its conversion rate. Another of the Backlinko findings mentioned above was that long-form content generally performs better than short posts or articles. How long should your content be, though? This depends on the topic as it is important you don’t make the content long for the sake of being long. When you do this, your risk repeating information just to increase the word count. On the flip side, don’t restrict the length of articles, i.e. they should be as long as they need to be to cover the topic in-depth and in as interesting a way as possible. SEO is not just about producing high-quality content, of course. For example, a large website with an international footprint that produces high-quality content following the tips above will still probably rank better than a smaller website, even if the smaller website produces content that is better. This is because other factors like domain authority and website backlinks matter too. That said, high-quality content is a crucial part of SEO, as well as being crucial to the success of your website overall. How important are product descriptions? After all, some products appear to sell just fine even though the description is poor. This doesn’t mean product description writing are not important, though. Make each product description unique – this can be a challenge if you have a lot of products. It is important to make them unique, however, both to help potential customers when they are viewing your website and for Google. Remember, even though some of your products may be very similar, using the same description on each one could be classed as duplicate content on Google. Duplicate content is one of the things Google does not like. Don’t get fixated on word count or length – there is no fixed length that your product description should be. In fact, there is no recommended length either as it simply depends on the product. This is because some products will require long descriptions, particularly if you have to describe what the product does. Others, however, will only need a brief sentence or two. An example is a pair of jeans, i.e. there is no need to describe what a pair of jeans does. Explain the benefits – most buying decisions are made on the basis of benefits. Therefore, your product descriptions should not simply be a list of the technical specifications of the product. Instead, you should explain how the customer will benefit from owning the product. Include all information on the product – the last thing you want is for a customer to go to another website to find something out about the product because you didn’t give them that information on your website. If a customer does that, they might never come back to you to complete the purchase. Therefore, if the information is relevant to the customer, you should include it. Write for your customers – this might sound like an obvious thing to do, but many product descriptions on the internet are not aimed at customers. Instead, they give the seller’s perception of the product with very little regard to what the customer thinks. To write good product descriptions for your customers, you must first understand who your main customers are. You should then tailor each product description to that audience. Make the description easy to read – this includes writing in a way that is informal and conversational. In addition, you should structure the text in a way that is easy to read. For example, you might think some customers will want to read a detailed description of the product and/or its technical specifications. Don’t push this content on customers who are not interested, however. A way of avoiding this is to put the additional content behind a link or tab, only leaving a brief description in the main section. Use bullet points – following on from the last point, lists of benefits or key features will improve your product descriptions. Think about SEO – where it makes sense, include keywords in your product descriptions to help improve the page’s ranking in Google. Always use images – in product descriptions, images are almost always more important than the text that accompanies them. A good approach for adding images to products is to follow Amazon’s guidelines for sellers. After all, when it comes to selling online, Amazon knows what it is doing. In general, product descriptions should be quick to read, they should keep the viewer on the page (rather than going elsewhere to get additional information), and they should encourage the viewer to make a purchase. The above tips will help you achieve this so you can sell more. Our website should be an extension of the sales and marketing efforts of your business. In other words, if your website is not helping you attract and retain customers, there is something wrong. The best way to make your website effective at generating sales is to have clearly defined objectives on each page. All the examples above either generate an immediate sale or give you the opportunity of making the sale at a later date. You don’t need to pick just one of the above for the pages on your website. In fact, it is better to offer multiple options relevant to the particular page, as well as multiple options per page. For example, a visitor might research the products or services you offer but are not ready to buy immediately. In this situation, you might encourage them to sign up to your email list. In other words, this page will have two objectives depending on the visitor’s intentions. Your website developer will be responsible for implementing the objectives on the pages, i.e. the developer will add the forms, call-to-action elements, shopping carts, maps, and more that will deliver on the page’s objective. In addition, a good website developer will help create the right user flow, so the visitor gets presented with objective one and then objective two if objective one is not immediately applicable. Call your business – include your phone number in a highly visible location on every page as well as including it as a call-to-action with the text on each page. Visit your business – ensure there is a prominent and easy to use map on the contact page of your website and possibly also the home page. Send a query – include a form that enables visitors to send a query. You should also ensure the form is in a highly visible location on each page. Become a lead – include a positive and persuasive message as well as a prominent form encouraging the visitor to send you their details for your sales team to get back to them. Download something – you have multiple options with this objective depending on the download. They include offering the download within the page, in a timed popup, or in a popup that appears when the visitor goes to leave your website. Make a purchase – include large and highly visible Add to Cart buttons and ensure the checkout process is as easy and secure as possible. Register with your website – make the registration option visible on all pages, give a compelling reason for registration, and make the registration process easy to complete. Sign up to your email list – strategies for this objective include adding welcome mats, in-content calls-to-action, popups, and more. Whatever industry you are in, and whatever type of website you have, every page should have a clear objective. By doing this, you are more likely to make it clear to the visitor what you want them to do next. This will improve the results you get from your website. If you sell products directly on your website, you will have a shopping cart abandonment rate. Unfortunately, shopping cart abandonment is a fact of e-commerce websites. This doesn’t mean you have to accept your current level of abandonment. In fact, there is quite a lot you can do to reduce shopping cart abandonment rates. They are all cost-effective, and they will all help you increase sales. Shopping cart abandonment is when a visitor to your website adds items to a shopping cart but then does not fully complete the purchase. They could abandon the purchase immediately after they put the items in the cart or they could abandon it at any stage up to the point of giving final confirmation. There are many reasons for visitors abandoning shopping carts. They include not feeling the website is secure, being surprised by an additional price, or becoming frustrated with a complicated checkout process. Add SSL encryption to your website. More and more people are now familiar with what this shopping cart abandonment rate, plus their website browser often tells them whether or not the website they are visiting is secure. Make the checkout process on your website as simple as possible. One of the best ways to do this is to go through the process yourself using both a computer and a mobile device. You should also get someone you trust from outside your business to go through the process and give you honest feedback. Ensure the pages on your website load fast. Even though the visitor is in the checkout process and is in the frame of mind to make a purchase, they will quickly go somewhere else if your pages take too long to load. Include delivery and other added costs upfront. This is one of the most important tips as forcing customers to get into the checkout process before you give them a delivery price results in a bad user experience. It also increases your shopping cart abandonment rate. Offer guarantees, such as money back guarantees, to make the purchase feel less risky to the customer. Don’t force people making a purchase on your website to register an account. You might like them to register an account for various reasons, but this additional layer in the checkout process often leads to a higher shopping cart abandonment rate. Therefore, give visitors the option of checking out as a guest. Add a call to action to your shopping cart to remind and encourage visitors to complete the checkout process. Add multiple ways to pay to stop visitors from abandoning the shopping cart because they can’t pay using the method you require. Adding a progress indicator is a simple but effective method of showing the visitor how much more they have to do to complete the checkout process. This clarity will keep them engaged for longer. Add trust logos such as Verified by Visa, Norton Secured, MasterCard SecureCode, etc. Analyse how visitors progress through your checkout process, paying particular attention to stages where they drop out. You can get this information from Google Analytics and it can help you identify areas for improvement. This final tip accepts the fact that even when you do all the above, you will still have visitors who abandon their shopping carts. These may not be completely lost, however, if you use remarketing advertising campaigns to win them back. Do you want your website to generate more sales for your business? Are you in the process of getting your website redesigned and want to make it the best it can possibly be? At Kiwi Website Design, we have extensive experience building websites that increase websites sales. Here are our seven design tips you should ensure are included on your site. There is very little a website design can deliver if the value proposition you offer to customers is not compelling enough for them to make a purchase. Therefore, the first step to increasing sales on your website is to decide what the value proposition is. The next step is to properly communicate it to your website’s visitors. The value proposition specifics will depend on your business. You can base it on price, quality of service, quality of product, innovativeness of product, or something else. Whatever it is, the important thing is the website visitor understands it and is attracted to it. A CTA is a call-to-action. It is one of the most important elements you will have on the pages of your website. Would a change of colour make the CTA button standout on the page more? Could the text be more interesting or positive? Is the CTA in a prominent enough position? Videos on websites increase sales. In fact, for some businesses, videos can increase sales by over 140 percent. You should, therefore, consider adding videos to your website. This could be product videos demonstrating the benefits of the product or showing it being used. If your business offers services, you can use videos to explain the service and how it is different from your competitors. This tip is about matching the style, colour, and tone of the website to your target audience. For example, bright and flashy colours with relaxed text will probably not work very well on a website for a company offering professional services to other businesses. This one can be difficult as many business owners select colours and make design decisions based on their own preferences and likes. This is understandable as you must live with the website and you should be proud of it. That said, never lose sight of your customers and what they like. The navigation and structure of your website should be simple and intuitive. Therefore, don’t place unnecessary restrictions on visitors in relation to navigation and avoid situations where the visitor lands on a dead-end page. Instead, try to create a logical flow for the user. If visitors can buy directly from your website, your shopping cart and checkout are crucial elements. Get them wrong, and you will lose sales. To get the checkout process right, make it as easy to complete and use as possible. In addition, ensure it is secure using SSL encryption. Trust elements include testimonials and case studies that show the user you are capable of delivering on your promises. They also include badges and logos to show you have the necessary qualifications and/or skills. You can also use badges to show how you have made the website and checkout process secure. Implementing the above tips will require resources and, usually, help from a professional website developer. The increase in sales you will get as a result, however, will make it worth the effort. If you just build a website and do nothing in relation to SEO, it is unlikely many people will visit it. Here are 10 essential SEO tips that will increase your visibility in Google. This, in turn, will bring more traffic to your site. There are lots of tools and platforms you can use to build a website. For most, however, the best option is WordPress. It is the most popular platform, it has powerful functionality, and it’s easy to use. Plus, it has great SEO plugins you can install – more of that later. When going through the process of getting a website designed, most people think about the desktop version first. This is not the way Google looks at your site, though. In addition, a significant proportion of your visitors will use mobile devices to browse and use your site. You should, therefore, concentrate on optimising for mobile first both in terms of appearance and functionality. Google hates errors on websites so you should find them and fix them. One of the best tools you can use to do this is Google Webmaster Tools. It shows you what Google sees when it looks at your site, including the errors. The next stage is to run your website through an SEO audit service. There are many services available for this including Neil Patel’s SEO analyser and SEMrush, plus you can do a search on Google for alternatives. Most offer a free initial analysis that will give you enough information to work on. This includes information on your site’s keywords, backlinks, page load speed, and more. Installing Yoast on your website. It is an SEO plugin with features like checking the keyword density on a page, showing you how the page looks in Google, analysing the quality of writing on the page, and more. There is a premium version, but the free version has enough features to get you started. Ensure the writing on your website is high-quality and error free. It is usually a good idea to use a professional proof reader, copywriter, or editor to do this for you. Ensure the visuals on your website are fantastic. This includes adding infographics and making images personal to your business rather than using stock images. The Yoast WordPress plugin will create this. You should then submit it to Google Webmaster Tools and to Bing. The sitemap helps search engines understand the content on your website. A blog will bring more traffic to your website, plus it helps with SEO. For example, a blog will bring more long-tail search traffic to your site. It also helps with the following tips. Google doesn’t take RSS feed submission into account but this tip can still help with SEO. By submitting your content to RSS feeds, more people will see it which will generate traffic as well as backlinks and follows on social media. Google does take these things into account. Guest blogging on popular websites in your industry will bring additional traffic to your website. It also helps to increase your profile and reputation. Plus, guest blogging will generate additional backlinks to help with SEO. Google looks at a number of factors in relation to your website. Generally speaking, it regards it as good when people who visit your website look at more than one page. Plus, the more time they spend on your site the better. Adding a related posts section helps keep people on your website for longer. There is quite a bit in the above 10 tips and you might need help implementing them. They are all, however, important for SEO. Google is working on what it calls the Google mobile first index. As with any significant change in Google’s search algorithm, it could impact your business by affecting the rank of your website in search results. To help you prepare, here’s what you need to know. To understand what is happening you need an overview of how Google works. It scans all the websites and pages it can find on the internet and puts those pages into its index. Its search algorithm then matches a user’s search to web pages in the index. This is how Google produces its search results pages. Google used to only look at the desktop version of a website. This was back before smartphones when everyone used Google’s search tool with a computer or laptop. Over recent years, however, more and more people started to use their phones when searching for something in Google. In fact, we have now gone past the tipping point – more people search on Google using a mobile device than a computer. This change in user behaviour is driving Google’s shift in focus. In 2016, it started prioritising mobile-friendly websites when its users searched on a mobile device. The search engine is now taking this a step further with the mobile-first index. Currently, Google’s main index contains the desktop version of websites. In other words, it looks at the structure, content, links, and other criteria of the desktop version and uses that to determine search rankings. The mobile-first index will change this focus from desktop to mobile to reflect the majority of its users. This means Google will crawl and index the mobile version of your site and will use that index to determine your position in search, even when the user searches with a desktop computer. In other words, Google is working on switching its primary index of the world’s web pages to contain mobile versions of those pages instead of desktop versions. What Will Be the Impact of the Mobile-First Index and What Should You Do? Responsive design – Google has recommended you use responsive design for many years. These are websites that dynamically adjust to fit the user’s screen. It means you can have one website, with that site automatically changing in size as required. This is the minimum you need to ensure you are not impacted by the mobile-first index. Optimised for mobile – often, a technically responsive design is not enough. This is because there is a wide range of screen sizes that users can have. Optimising your website means carefully structuring the content for each grouping of sizes, focusing heavily on usability and not just appearance. Content – the beauty of responsive sites is you have content on one website which displays regardless of the screen size. There are some responsive website designs where the content displayed changes as the screen gets smaller, i.e. websites that show less content to mobile users than desktop users. If this applies to your website, you will need to take action. Optimise the content – you should also look at the structure of the content on your pages as this should be optimised for mobile too. This means having a clean and uncluttered design with text that is super easy to read. You may also need to adjust your images so they look better on mobile devices. After all, your laptop or desktop computer’s screen has a landscape orientation while your phone is typically used in a portrait orientation. Images on your phone will, therefore, look different than on your computer. Speed – speed has always been important to Google. Focus on making sure the mobile version of your site loads as fast as possible. Interstitials – these are popups that you might have on the mobile version of your website asking visitors to sign up to your newsletter or offering them a discount. If you have interstitials, you might need to review your strategy as Google doesn’t like them. The best advice is to take steps now to ensure your website is ready for the mobile-first index. Running a Google AdWords campaign can be a frustrating process. After all, you can see loads of ads when you do a search for your targeted keywords, so somebody must be making money. Also, if you read about digital marketing you will know that many businesses achieve significant returns on investment from AdWords. Why, then, are your campaigns not making you money? In the list below you will find some of the main causes of AdWords failure. The most important thing to remember, however, is that AdWords is not as simple as it looks. Of course, it is correct to say that almost anyone can set up an AdWords campaign, and you can complete the process quickly. The process, however, is misleading. The real key to success is not completing the form on the AdWords’ interface to launch your campaign. Instead, real AdWords success comes from digging much deeper into the process and understanding how Google works. When you do this, you can get better positions for your ads, higher click through rates, and improved conversions. You can also lower your costs. That sounds great, doesn’t it? It often means getting help from a company with a proven track record of AdWords success. Working with an AdWords professional is also often the fastest way to improve ROI. Failing to optimize – many people, including some who provide AdWords management services, operate a “set and forget” approach to AdWords campaigns. In other words, they don’t regularly check the performance of keywords, bids, audiences, and more to make improvements. Optimization is absolutely essential to the success of an AdWords campaign, however. Using too many broad keywords – broad keywords often result in irrelevant clicks. This brings traffic to your website but it is not traffic that will ever convert. That is bad enough on its own but those irrelevant clicks can also damage the performance of your overall campaign. This is because while the user that clicks is irrelevant to you, your website can also be irrelevant to them. That means they have a bad user experience which Google does not like. Reducing the number of broad keywords or making the keywords phrase match or exact match are the solutions. Not using negative keywords – another method of reducing the number of irrelevant clicks you get on your ads is to use negative keywords. Negative keywords are an option when setting up an AdWords campaign, though, so many people don’t use them. If you don’t, this could be one of the reasons your ads don’t make money. Not focusing on click through rate (CTR) – all AdWords metrics are important, but CTR is one of the most crucial to a successful campaign. Of course, a higher CTR means more traffic to your website but it is also important for the position of your ads. Remember, Google is a business so it wants users to click on its ads to make it money. Therefore, it puts the ads it thinks will get the most clicks in the best positions on search results pages. If you have a good CTR rate, you will increase the chances that this will be you. Not including unique selling points in ad text – the text you use in your ads must give users a reason to click on them rather than one of the other ads they can see. This means you need a unique selling point. This could be discount or price related, but it can also be about quality of service, more customer benefits, or another reason that makes your ad stand out and makes the user want to find out more. Not using keywords in the ad text – keywords help you target the right audience to get relevant traffic, but they can also help users understand what your ad is about and how you can potentially help them. You should, therefore, include keywords in your ad text. Not split testing – one of the most important split tests to perform in AdWords campaigns is the ads themselves. You should have multiple versions running to see which performs better. This should be a constant process too, as just because one ad performs better than another doesn’t mean you can’t come up with something that performs even better again. You should always tweak, change, and try new ideas, testing different variations of your ads against others. You have a website that doesn’t convert – getting a click on your ads is only part of the process of making money from an AdWords campaign. This is because you must also convert that click into a customer. This means having a website that converts. If yours doesn’t, you will have to make changes which typically means getting help from a reputable website design company. While these are the most common, there are other reasons why AdWords campaigns fail. This demonstrates how complex the process can be. It is possible to find success, however, by getting the help you need and/or taking steps to optimize and improve your campaigns. Getting traffic is only one part of making your website successful, and it is not even the most important. Maximising your conversion rate is where you should focus most of your efforts. Here are 12 ways you can boost your website conversion rate. Your objective is to get visitors to your website to convert now. If they leave to think about it, they won’t come back. Creating urgency is a great way to encourage visitors to take immediate action. There are several ways of doing this including mentioning stock numbers or making the offer time limited. You can even add a countdown timer to your pages to make the urgency more real. The forms on your website should be quick and easy to complete. This particularly applies to email opt-in forms – the more fields you ask visitors to complete, the less likely they will be to give you their email address. Make sure your checkout process is intuitive and fast to prevent customers from starting it but not finishing it. It also helps to make your checkout look secure. Exit popups are an excellent way of making a final pitch to your visitors before they leave your website. Depending on the conversion you want to achieve, they can significantly increase your conversion rate. The offer you make should be compelling plus you should follow the above points – make it time limited and optimise any forms you use. Another effective way of increasing conversion rates is to remove doubt or worry from the minds of your visitors. You can do this by offering a guarantee – a 100 percent money back guarantee will be the most effective. Another tactic is to offer a free trial. Nobody wants to be the first to try something so it is important you show customers your experience and standards of service through testimonials. Testimonials should be relatable to the customer and should not only be genuine but should also look genuine too. The area of your website above the fold is the part of the screen that you can see without scrolling. This is where you should put your conversion elements including offers, buttons, and forms. Simple designs often get the most conversions. There are a number of reasons for this including the fact that flashy designs do not help visitors make a buying decision. You should also remove all unnecessary distractions. Your conversion rate will improve the more personal you can make your content. You can do this through the copy on your website, plus you can use tools that geotarget your visitors. Geotargeting involves dynamically showing personalised content to your visitors based on their location. You should also personalise your emails as much as possible, particularly including the recipient’s name. If you run PPC campaigns, you should use dedicated landing pages. Remarketing helps you win back the people who visit your website but don’t convert. Assuming they plan to make a purchase from someone, remarketing helps increase the chances that it will be you. You firstly need to measure your website’s conversion rate then you should test all the strategies you use to see what works so you can make refinements. Finally, treat conversion rate optimisation as an ongoing process that you continuously work to improve. Google News generates billions of clicks to publisher websites every month. Just think: what if you could get just a few thousand of those clicks to your website? It would be great, wouldn’t it, but what if you are not a publisher or a news organisation? The truth is this in itself does not exclude you from inclusion in Google News. Whatever type of website you have, you can get into this high-potential Google platform if you follow the right steps and think the right way. It takes daily effort, but if you believe Google News traffic is potentially beneficial to your business, you can do it. Here’s how. There are several things you should consider when planning how to get your website included in Google News. In fact, Google itself publishes a long article on how to maximise your chances. At the top of the list, however, is you must publish news. Cover recent events – news organisations publish stories covering recent events. Generally, this excludes opinion articles, advice articles (like this one), or information articles (like reporting on the weather). In addition, while evergreen content is great for general SEO, it won’t work on Google News. Publish original stories – copying content published by others will not work on Google News. This doesn’t mean you can’t write a story about a topic covered elsewhere. Instead, you must find your own angle, add new information, or move the story along in some way. Write objectively – good news reporting is balanced so you should keep your articles as objective as possible. Write the story well – this includes straightforward standards like getting the spelling and grammar correct. You should also structure your article like a news article. This means giving the main details of the story in the first paragraph and generally structuring the article throughout by giving the most important information first. As you might expect, there are lots of other standards you should learn to help you write good news articles including using an active voice and writing in the present tense. A good starting point to learn these standards is the Associated Press style guide. Publish regularly – news organisations publish stories regularly so you should too. This means aiming for at least two per day. If you feel you can meet the above requirements, here are some other things you should consider before applying for inclusion in Google News. They will increase your chances of approval and also help to maximise your traffic once your links start appearing. Be honest and transparent with your readers – firstly, don’t mislead your readers about who is behind your website. You should also publish online and offline contact details, i.e. email addresses as well as a physical address and phone number. Build credibility as an author – publish on websites other than your own to build up your author profile. Write good headlines – include keywords and make sure the headline is informative to readers. Make your website mobile responsive – this will help improve the visibility of your stories in Google News searches on mobile devices. Once you have all the above in place, and you have checked your content does not breach any of Google’s general guidelines, you can apply to have your website included in Google News. Link building has become one of the most important practices for better SEO performance. Backlinks are like votes of popularity for your website to search engines. The higher the quality of the links and the more of them you have, the greater ranking potential your web pages will have. According to a recent survey by Moz, 37% of business owners spend $10,000 to $50,000 per month on link building. That’s how important it is. Backlink quality is measured from the source the link comes from. One of the important factors is that your backlink is inserted with proper content. Otherwise, it will look like spam. For example, a backlink to a tech blog would have great value if the link is inserted in an article that gives tech information. That would be a credible backlink with good contextual relevancy. The other variable that determines the quality of a backlink is the authority of the link’s source. Google puts a measure of authority on all websites, ranging from 0-10. It is called PageRank, or PR for short. So, a website with a PR7 (high authority) offers greater link value – or link juice – than a PR1 (low authority) website. Building quality backlinks for SEO involves a combination of utilising high authority link sources and sources that offer some degree of contextual relevancy. This is the foundation of SEO link building best practice. Read this blog post for good SEO practices to get you started. Blogging: Create and maintain a blog that is a separate domain from your money site (the web site receiving the links). Build the blog around a niche topic that relates to your money site and frequently publish content with backlinks integrated into the blog post’s copy. Guest blogging: Guest blogging is one of the most effective ways to build backlinks on higher authority blogs. This takes some effort as you must find good blogs, contact the blog owners, and inquire about writing a blog post for their blog. RSS feed: Have an RSS feed on your blog. Doing this is free and easy to set up. An RSS feed is advantageous as it allows people to syndicate your content to generate greater interest and increase the popularity of your blog. This can then result in others providing attribution links back to your pages. Press releases: Write and distribute press releases regularly. The key here is to publish your press releases through distribution sites that allow you to add backlinks in the copy, as well as other sites that offer great coverage and authority. Create case studies: Writing a case study about a client who has succeeded through your services will not only display credibility in your company but also generate interest from the client. Quality clients will often link back to your website out of respect for your solid PR stunt. Link to other relevant blogs: Often, linking to other related blogs can generate link reciprocity. In other words, some blog owners are likely to return the favour. In some cases, you may want to make it known that you are linking to their blog as not all blog owners check their backlinks. Create visual content: Consider diversifying from text to visual content such as images, infographics, charts, and cartoons. Not only will these techniques attract readers, but they will also earn and retain backlinks. Social sharing widgets: Social sharing widgets on your web pages and blog posts – like Twitter’s “tweet this” or Facebook’s “like this” – can go a long way to propagating your content and generating link popularity. Write reviews: When you give a positive review of a company or a piece of content (like a book), chances are the author or website owner will link back to your website. Offer free tools: If you have skills in a particular service or niche, create and offer free tools and resources. This is one of the best ways to attract new business and quality backlinks. We hope these ten link building techniques will get you on your way to generating quality links to start raising your rankings in search engines. If you find it difficult to do this, you may need to hire a backlink building service. On-site SEO involves optimising web pages to rank higher and gain more traffic in search engines. On-site SEO includes optimising the content and HTML source code of a webpage. Off-site SEO, on the other hand, involves optimising external links. So, do you want your website SEO optimised to get more traffic from search engines? If your answer is yes to the above question, you should consider optimising your website. Today I will focus only on the on-site element and will share basic information that impacts website optimisation. The domain name is an important part of on-site SEO. However, with Google’s EMD update, having an exact match domain name no longer matters a lot in SEO. Nonetheless, the domain name adds credibility and relevancy to your blog. It can help users decide if the blog is the right one to get the information they are searching for or not. Another important component of on-site SEO is the meta description. This is a short overview of what the blog is all about. The statement that you input here will be used by search engines to describe your blog. This will also be the short statement that will appear in search results pages. The meta description can heavily influence the search user’s decision on whether to check out your site or not. This is also used by the search engine crawlers when ranking websites for certain keywords. Therefore, make sure that your target keyword term is present in the meta description. Web content is a key area that greatly matters in on-site optimisation. Quality and uniqueness of the post must be given due focus so each post must be unique. Ideally, it should not be published elsewhere so it is distinct to your site. Aside from that, it should contain highly valuable information and an eye-popping title that effectively grabs attention. Another factor in on-site SEO is internal links as they must be properly placed. Each page should, ideally, have a link from another page or from the homepage. The internal link structure should also be flawless to ensure visitors can quickly and conveniently find the right pages relevant to their search. Metatags are HTML elements that provide information about a web page for search engines and website visitors. These elements must be placed as tags in thesection of an HTML document. The anchor text is the visible, clickable text in a hyperlink. The words contained in the anchor text can determine the ranking that the individual page will receive by search engines. Another important component of on-site SEO is rich media files. These are the relevant photos and videos included your web pages. These files further add value to your posts, while the relevancy of the photos and videos can reinforce the search engine’s assessment of the webpage. These files should be properly inserted with alt-tags that are relevant to the main target keyword phrase. Loading speed and bounce rate have little SEO value but they can add up to give you better page ranking due to enhanced user experience. The loading speed of the webpage can affect bounce rate and it can also cause some visitors to leave if the page loads too slowly. Author adminPosted on December 20, 2017 May 28, 2018 Categories Blog, Online Marketing, Seo, Web DesignTags Design, Onsite SEO, seo, Website Design, Website RankingLeave a comment on What is On site SEO? Everyone wants their website to have a better Google search ranking to increase website traffic and enhance visibility. The Google search engine uses various algorithms to rank pages in its search results. Its algorithm is a secret so is not shared by Google, although there are many basic ways to improve your rank in search results. This involves using techniques known as Search Engine Optimisation, or SEO. SEO takes time and there is no quick solution. If someone tells they will get you fast results then it’s probably a scam. The most important thing you need to make sure is that you have a website that people want to visit. Also, never use black hat techniques that can, at a later stage, be detected by Google as you will end up getting blacklisted. When someone is on a search engine to find your website, they will write a relevant word or phrase – this is called a keyword phrase. Your keyword phrases should appear in your content, ideally in the first paragraph. You should also use words in your articles that people are most likely to use when searching. For instance, what keyword phrase might people use to search for your website? Try this with your potential customers to find the best words for your content. In addition, it is highly recommended you use one key subject per page. Also, avoid irrelevant content completely. Keyword density refers to the number of keywords used in your content. It is recommended you use natural phrasing. Overusing the keyword to trick the search engine can also get you banned. Your first paragraph should be a strong opening to tell people what your page is about. This practice also helps search engines find your page. Giving a descriptive name to the title of your page is essential. The first thing you notice on a search results page is the page titles of the results, so your titles must be related to the topic and appropriate. Best practice is to include the page’s keyword phrase in the title. Links from other websites to your website determine the PageRank of your website. More links mean a higher PageRank. You can exchange links with other relevant websites or blogs. Furthermore, links to the content on your pages should include keyword phrases in the anchor text. Promoting your website on social media sites can affect your rank in search as well as bringing more traffic to your website. So, make sure you publish engaging titles and images that link back to your website. According to The Verge, more than half of Google searches are now done through mobile. If your website is not mobile-friendly, Google will rank you lower in search results pages. Google also indicates onsearch results pages if a website is mobile friendly or not. Therefore, don’t forget to make it responsive. So, what is Infographic? According to Wikipedia, infographics are visual representations of information, data, or knowledge intended to present complex information quickly and clearly. In other words, infographics are a way of presenting information that is uncomplicated and easy to read. You may have seen infographics while surfing the net or on social media. They are simple, easy to understand, and interesting to read. Nowadays, infographics rule the internet. According to Unbounce, the demand for infographics has increased by 800% in the last two years. Recent research by WebMD stated that a human brain can register visual information 60,000 times faster than normal text. In addition, 65% of people are visual learners. Infographics can certainly double your website traffic if you do them right. However, not all infographics go viral. There are some important factors you should take into account when creating infographics for marketing purposes. How you visually present the collected data in your infographic is a very important part of the process. You can use graphs or flow charts, for example, but make sure you consider how the audience will perceive the data. Another important factor is the title you give your infographic. For instance, if the infographic is a how-to,you should title it accordingly. Your content should be statistically correct or verified from a reliable source. You won’t convince your audience with information based on your personal opinions so don’t base your infographic on them. Use a unique approach for your infographic. For example, don’t follow the same format your competitors use. Instead, your infographics should have interesting graphics and characters that tell a unique story that is quick to read. Choose interesting topics that people will love to read. It is not easy to grab the reader’s attention unless you have a trending topic to talk about. The best way to achieve this is to search for topics on Google Trends to find out what people are talking about. Creating useful infographics means providing readers with a deep insight into the topic that they can read and understand in short span of time. Make sure you get your infographic professionally designed. After all, if you have good-quality content but don’t have an attractive design, your infographic will fail. This is often because people will be hesitant to share the infographic. So, it is best to get it designed by a professional graphic designer. Use an embed code generator to make it easy for users to share and embed your infographic. When you do, your infographic will have a link back to your original social media page or website. This will bring you additional traffic. Infographics definitely increase traffic. It is best to use them to optimize your website for conversions so you generate more leads and sales. You can attach promotional messages with your infographics as well, to market your business. Social Media is one of the world’s fastest growing industries. If you are not taking advantage of social media platforms you might be leaving lots of money on the table. Social media marketing strategies can be complex, however,because of the increase in the number of social media platformsthat are available. Furthermore, growing a social media account requires time and hard work. If you want to market your business or website through social media platforms, keep the following points in mind. First and foremost, you must find your target customers. This requires proper research to discover where your customers are most active on social media. You must look if your target audience is made up of Facebook users rather than Twitter users, for example. This will save you energy and time. The quality of the content you post on social media is very important. If your content is interesting,the user will share the post which will increase your reach. Therefore, it is important to have content your users will love to read and/or content that benefits them in some way. In addition, reposting a link from another website for the sake of keeping your page active will be of no use. Consequently, your content should be unique and compelling so that it gets clicks. Influencers on social media play an important role. You should find influencers that appeal to your customer profile, who reflect your business philosophy, and who have a high-quality audience. Connect with these influencers and create a positive relationship with them. If your content and services come across as interesting or show you are an authority on the matter, they could introduce your business to a range of new customers using their social media presence. This kind of exposure is very valuable since you donot have access to this audience on your own. Don’t post something and then just disappear for a few weeks. Social media audiences have too many choices available and if you’re not visible, you can be cut from their list very easily. Make sure you have a clear calendar set out with a social media plan to publish content and posts on set days and at set times to encourage interaction with your users. When users post queries and requests do not ignore them. Answer comments and messages as soon as possible with a solution or ask for their details so you can contact them immediately. Business pages where queries are ignored are a red flag for many customers who worry that they will be ignored should they make a purchase or order something. How you manage your social media accounts is a reflection on how you manage your business, even if your business runs smoothly and without issue – your users won’t see it that way. Many people turn to social media for reviews and to see how a company handles its customers, so put on a good show. Keeping your posts and messages consistent on social media pages can help you increase engagement with your customers. Moreover, it will help you develop trust with potential customers. For instance, if a customer comes to your Facebook page and sees that you have not posted in a month, they could assume you are out of business or are not a reliable company. In other words, not posting regularly gives a negative impression of your business. Therefore, it is necessary to be consistent and keep your social media page active. In today’s fast-paced world, every business or individual has a basic website. Sadly, most of these websites are poorly designed or not focused on lead generation. These types of website are not going to help your business or your reputation. So, the first question that comes to mind is: should your website focus on design or leads? Studies of user behaviour by ImpleMedia have found that first impressions are 94% design-related. So, website design is important but if it is not generating sales or revenue then the design is of no use. We usually hear from customers that they want a fresh look for their website. If that is the only requirement there are many cheap solutions available. However, if you want to invest in a website to boost your business, the website should focus on generating leads and converting sales. For example, avoiding website designs that are too complex as they often turn visitors away. In fact, this is one of the reasons some incredibly good-looking websites fail to deliver sales. Investing in a well-designed website that builds interest and converts leads is a great way to boost your business. Therefore, your website must be designed correctly so it attracts more leads for your business. Include offers like downloadable eBooks, guides, and checklists on your website. Videos are also a great way to engage customers. Place Calls-To-Action (CTAs) in strategic locations throughout your website. For example, they can be installed as a sidebar ad where the customer can fill out their contact information. This is a great way to generate leads when you have people looking to find out more information about your products or services. Smart content provides the buyer with relevant content based on their interests or the stage they are at in the buying cycle. Smart content best practice is to move your website to a content management system so you can update the content on a daily basis. Also, writing a blog at least twice a week can help attract more traffic. Always keep your message simple and to the point. Place CTAs strategically throughout your site. Place CTAs on all pages. Use social proof like client lists or testimonials. Don’t forget to include graphics where appropriate. Otherwise, your website will bore your visitors. Author adminPosted on December 20, 2017 July 10, 2018 Categories Blog, Online Marketing, Web DesignTags Landing Pages, seo, Website, Website DesignLeave a comment on A Website Designed To Look Good Or Designed To Get Leads?